The private spaceflight company SpaceX is opening its doors to a lucky person with cash to spare for charity. SpaceX president Gwynne Shotwell is partnering with the charity auction site Charitybuzz.com to offer bidders the chance to tour SpaceX's facilities in Hawthorne, California. The winner of the auction will also get a chance to meet with Shotwell during the visit. While there will only be one overall winner, that person can invite nine other people to join in on the tour. "The lucky winner and their guests will get to see Falcon 9 rockets being assembled, Merlin engines being constructed, a Dragon spacecraft in production and even a Dragon that has returned from space," according to a Charitybuzz.com description of the auction. "These tours are not available to the general public, making this an incredible opportunity that's not to be missed." The highest bid currently stands at $6,250 with 10 days left to go before the auction closes. Money raised from the auction benefits the Women in Technology Foundation. 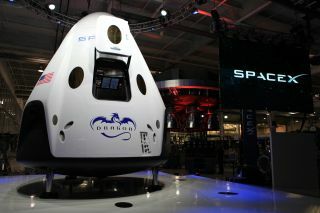 SpaceX's billionaire founder Elon Musk recently unveiled the new prototype of the manned Dragon spacecraft from the company's headquarters in California. The new Dragon, called Dragon Version 2, is designed to ferry up to seven astronauts to and from the International Space Station and other locations in low-Earth orbit. SpaceX currently holds a $1.6 billion contract with NASA to fly 12 missions to the space station using their unmanned Dragon capsule. So far, the company has successfully completed three of those missions.